I love superhero movies. I’ve seen all of the Marvel movies, most of them in the theatre. I like the heroes of literature too–Beowulf, Van Helsing and Aragorn. I think it’s an essential character trait of every hero that he or she is usually concerned for the wellbeing of others–often to the point of death. Zombie movies don’t have heroes like that. Our heroes have changed because we have. Literary heroes represent ideals and ideas that are valued by a society– self-sacrifice is often one of these ideals, but certainly not the only one. Like monsters, heroes change to reflect their contemporary cultural context. Like all heroes, the heroes in zombie films “face crisis situations in which they must assume extraordinary personal responsibility and make exceedingly difficult choices” (Robinson [Fear] 23). The modern hero has to make these choices in a modern world and that means there is no transcendent ideal to guide these decisions. Their choices are often between some moral principle and their survival. The focus in these moments of crisis is on the agony of the choice, rather than on the sacrificial nature of the hero. And despite the agony, the choice is almost always in favor of survival. Simon Pegg points out that “the protagonists of zombie invasion movies are not superheroes or professional monster slayers like Van Helsing – they are common, average folk forced to ‘step up’ and defend themselves” (Bishop 117). So, just as the zombie is an immanent monster, the hero in the zombie narrative is an immanent hero. In Night of the Living Dead, the fate of the character Ben reveals the demise of the traditional hero. Despite his failings, Ben is “the closest any of the human beings in Night of the Living Dead come [sic] . . . to being the sort of hero that is found in previous monster narratives” (Waller 295-96). For lack of any better place to put it, the audience puts their faith in Ben. This faith is regularly challenged, however. Ben is protective of Barbara, but only somewhat so. When Barbara first enters the farmhouse, she discovers a partially consumed corpse and flees. Ben, having just arrived in a pickup truck, intercepts Barbara, and with a tire iron gallantly dispatches several lurching men, who are becoming numerous, and finally leads the hysterical Barbara back into the house. Ben is a hero defined, not by knowledge or depth of belief, but by his actions (Waller 284). As soon as he arrives at the farmhouse and discovers Barbara, he gets to work barricading the doors and windows. His heroism is rooted in a material and practical—the immanent domain. After the others are discovered in the cellar, he seems to expect they “will prove to be as competent as he has proven and that help will come to those who help themselves” (Waller 285). He does not see himself as one who supersedes the others in ability. Whatever capacity he has, he expects it to be present in everyone else as well. The radio reports widespread attacks by people seemingly in a trance; later there are reports of widespread mass murders and cannibalism. The situation is stressful, and Ben does not always deal with it very well. He obviously lacks leadership skill, For example: he engages in bickering with Harry; he overreacts in anger on several occasions, the last of which results in his shooting of Harry with the rifle. It is further obvious that he is not a traditional hero when he fails to save Barbara or any of the other temporary residents of the besieged farmhouse. He merely survives the night. In the morning, a posse, which has been killing the remaining zombies, approaches the house. Hearing them, Ben cautiously goes up the cellar stairs into the living room and is mistakenly shot dead by a posse member who takes him for a zombie. His body is carried from the house and burned with the zombie corpses. Rather than standing next to the vanquished foe, or at least honoured by the survivors for his sacrificial victory, the hero instead lies, undistinguished, on a pile of dead monsters. In Night of the Living Dead, the action is bookended between two scenes that “intimate that the zombie-human distinction is not that easily made” (Cooke 167). In the first sequence, a zombie is mistaken for a man, and, at the end, a man is mistaken for a zombie, and shot and burned as one. Thus, the movie gives its viewers a picture of a flattened world, for in the death of each character, we see the death of every previously-held source of fullness or meaning. In Ben’s death, we see the utter meaninglessness of everything in a world without the transcendent. The immanent “hero” of this film burns like the great hero Beowulf, but this is no funeral pyre, but a garbage fire. There is little difference between hero and monster, given that Ben is laid upon a bonfire to be burned. Waller’s explanation of the action around the final bonfire reinforces the absence of any meaning that we can take from the film. The men in the posse have no idea they have misinterpreted the situation in shooting Ben; the movie audience alone is privy to this information. McClelland orders a deputy to burn the grisly heaps of the formerly undead. Because McClelland is the final human being we see in the film, Waller calls him the survivor. As such, we can look to him, and his fire, for those things that endure. He is “unemotional and almost cynically mater-of-fact. He is concerned not with explanations, but only with getting his job done. The work he is engaged in is just work and not a mission, much less a holy crusade” (Waller 297). Ben suffers exactly the same fate as the monsters, and the tragedy the night before is nothing more than a day’s work for McClelland and his men. McClelland’s attitude is what is required of secular man in the flattened world. The death of the thoroughly immanent hero symbolizes this symptom of the modern identity “whose very invulnerability opens it to the danger that not just evil spirits, cosmic forces or gods won’t ‘get to’ it, but that nothing significant will stand out for it” (A Secular Age 303). In Night of the Living Dead, “every convention of heroism is overturned by Romero’s script” (Russell 68). In its treatment of the hero, Romero’s Night of the Living Dead reflects what Charles Taylor called the modern malaise. One of the effects of modernity is a malaise in which we get the sense that our lives “have been flattened or narrowed” (Malaise 4). The movie clearly illustrates the loss of the “heroic dimension of life,” at least of a sense of what we might call a higher purpose, “of something worth dying for” (Malaise 4). This malaise is, then, particularly acute for those who live in a consumer culture, who “feel [the] emptiness of the repeated, accelerating cycle of desire and fulfillment in consumer culture; the cardboard quality of bright supermarkets, or neat row housing in a clean suburb; the ugliness of slag heaps, or an aging industrial townscape” (309). The malaise of immanence that is felt so deeply in consumer culture is exploited in Romero’s second movie about the undead. Not only is it difficult to attribute the term “evil” to this most modern of monsters, but it is also difficult to attribute the term “good” to the “heroes” of the zombie movie. In fact, the primary victim of the zombie horde is not the humans that battle the undead for survival; the primary victim is “Good” itself. In Night of the Living Dead, each character seems to offer some gesture toward a source of fullness or a transcendent value, but these are ultimately shown to be meaningless, for in each case the virtue does nothing to improve the condition or survivability of the protagonist. As each character falls into the clutching hands of the undead, so too does the value he or she embodies. All transcendent values and ambitions are consumed by the zombie horde. But Barbara’s initial survival does little more than ensure she “will face a much more horrible and ironic fate at the hands of the undead” (Waller 282). In the meantime, Barbara flees, pursued by the strange man, to a nearby farmhouse where she will eventually be killed. Christian faith and devotion, then, are clearly shown to be no greater help than mocking disbelief. Christianity and religion are not the only traditional values that fall victim to the undead; the values of collective action, romantic love, and the nuclear family are also useless. These traditional values are represented by characters who emerge from the cellar of the farmhouse later in the film. Tom and Judy, a young couple, represent “sticking together” and romantic love respectively. Tom’s advocacy for collective action in combating the creatures begins immediately. When the two other men are heatedly debating their plans for survival, Tom says, “We’d be a lot better off if all three of us were working together” (Night). His views are shown to be naïve and idealistic, for in the one attempt to work together he is killed and the only hope for escape, the truck, goes up in literal flames. Romantic love suffers the same fate. Judy, Tom’s girlfriend, cannot be without her love and runs to be with him as he attempts to fuel the pickup truck. One of the torches used to hold off the zombies accidentally gets into contact with some of the fuel Tom spills. Tom attempts to move the truck to safety, but it is clear that it is too late. He jumps free from the vehicle, but Judy’s jacket gets caught. He jumps back into the truck to rescue her just as it explodes and both are killed. Rather than being a powerful force of salvation, romantic love leads instead to the death of the young lovers who embody it. These deaths “serve no purpose,” once again showing that “the real horror of Night of the Living Dead is that there is nothing we can do that will make any difference at all” (Dillard [in American Horrors] 28). The Coopers represent the nuclear family. The Coopers, Harry and Helen and their daughter, Karen, had been hiding in the cellar of the farmhouse with Tom and Judy. The little girl Karen has been bitten by one of the undead and is feverish and weak. Barbara, whom the audience associates with a traditional heroine or damsel, saves Helen from the clutches of the undead only to be dragged out the window by her re-animated brother, Johnny. The family violence continues as Helen stumbles into the cellar only to see her daughter, who has become a zombie, eating her slain husband. She is defenseless as the little girl attacks and kills her with a cement trowel. Romero shows that “whatever the living do in the film, whether they are brave or cowardly, rational or hysterical, in love or embittered, the result is the same: death” (Cooke 168). As a matter of fact, Dillard asserts that “those virtues that have been the mainstay of our civilized history seem to lead to defeat in this film even more surely than the traditional vices” (23). The monsters aren’t really evil, and values and virtues are really of no good; the next post is about the hero of the zombie narrative. The type of death one can expect from a zombie is nothing if not intimate. They use no secondary object, like a knife or even a rock. They use only their own teeth and hands. Victims are frequently shown having their abdomens violated by a group of zombies who proceed to then put the vitals into their mouths. Like I said—intimate. In our culture we resist intimacy. There was a time when servants would bathe and dress their betters, but nowadays we have a hard time carrying on a conversation with someone standing next to us at the urinal. Charles Taylor observes that our culture is characterized by a “withdrawal from certain modes of intimacy, as well as taking a distance from certain bodily functions” (Taylor 137). Taylor cites the work of Norbert Elias in his book, The Civilizing Process, where he describes a shift involving a “steady raising of the threshold of embarrassment, one might even say, disgust” (Taylor 138). Where once people were advised not to blow one’s nose in the tablecloth, we now insist on leaving the table to perform the same act. We are uncomfortable with intimate connections to others. It is the convention that bodily functions are not even mentioned. How much more offensive is the disembowelment and consumption of entrails witnessed regularly in a zombie film. Clearly, this is a monstrous affront to our modern sensibilities. Jaime Russell claims that the ultimate meaning of the zombie is as “a symbol of mankind’s most primitive anxiety: the fear of death” (8). Well, our primitive fear is our modern fear and the zombie forces the modern self to face it. Death is persistent and there is nothing we can do to stop it from getting us eventually. One of the strategies of we modern people to deal with the fact of death is to just not think about it. But we are also fascinated by it in zombie movies. are death and they will get you in the end. We could all be in a room now with one and quite happily walk round and round the room and he’d never get you because he’d just be stumbling along. But eventually you’d have to go to sleep and when you did, he’d eat you. There’s just something really eerie about that (Russell 183). Death’s persistence has always been with us, so this characteristic of the zombie isn’t what makes it a uniquely a modern monster. Almost all monsters kill us, it’s like their thing, but it’s just not the killing bit that is the problem these days—it’s the death. Zombies do not just deliver death, but they also embody death as we understand death in the modern world. Like all monsters in the history of human storytelling, the zombie kills its victims, but the threat of death’s inevitability is more significant when one lives in a reality without the transcendent. In this context, life is equivalent to biological life. Without any future beyond this world, the zombie horde represents to modern man an “ambulatory mass grave” and as such is “both a reminder of the inevitability of death and an affront to [modern man’s] belief in its finality” (Russell 69). Unlike preceding centuries, in the modern materialist universe, death is final. It is not, as in the past, a transition through which one passes, but a permanent state of non-being. 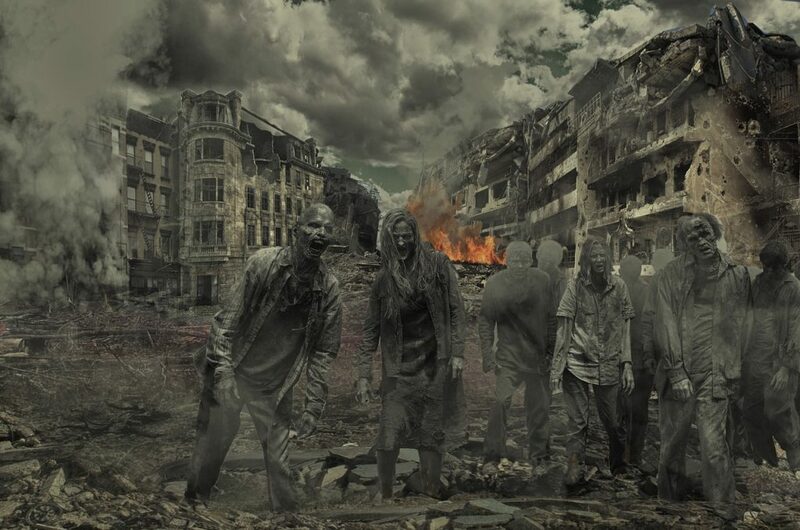 Without any future beyond this world, the zombie horde represents to modern man an “ambulatory mass grave” and as such is “both a reminder of the inevitability of death and an affront to [modern man’s] belief in its finality” (Russell 69). Unlike preceding centuries, in the modern materialist universe, death is final. It is not, as in the past, a transition through which one passes, but a permanent state of non-being. The zombie articulates a profound—and profoundly modern—shift from older cultural attitudes about death: “the process of dying no longer means the conveyance of our eternally unchanging soul to another, more timeless realm; rather, death becomes a state we inhabit within our own earthly vessels, something we become rather than somewhere we go” (Muntean 83). The zombies are an abject horror in themselves, but what they do to their victims is even more horrifying. Spurting blood and biting of flesh, and the ingestion of slippery entrails and bloody organs, are staples of the zombie genre. The zombie film exploits the fear that, in the absence of any transcendent meaning, we are nothing but vulnerable, and soon to be dead, flesh. Stephan Asma describes how modern horror focuses on “the subjective revulsion and terror of the flesh.” In the absence of the transcendent, there is a terror in “all things biological” (198). The violence done to bodies, both of the living and the undead, forces modern viewersto consider the possibility that the human body may be “nothing more than meat, aligning human beings apologetically with stockyard animals and game” (133). This is a scary idea, indeed. Zombies (9): Why are zombies so disgusting? Zombies are disgusting–open wounds, fluids running out of their orifices, and what’s that stuck in his teeth, a piece of Barbara? The Victorian wolfman, for example, transgressed the boundaries between human and animal in order challenge and perhaps clarify the boundary between these categories. At that time, one of the challenges to the collective identity came from the ideas in books like Darwin’s Origin of the Species. What is a human being? There is a category of things that disgust us because they occupy the space between the self and the other–bodily fluids for instance. We find these revolting because they transgress the boundary between the self and other–they are in between what is clearly me and what is clearly not. Because zombies leak bodily fluids all over the place, they are an embodiment of this sort of revulsion. Julia Kristeva puts vomit and pus and that sort of thing in a category that she labels the abject and suggests that, because the abject challenges boundaries between self and other, our identities are formulated against it. Because the abject challenges boundaries between self and other, our idenities are formulated against it. Julia Kristeva describes the abject as being “neither inside nor outside, neither subject nor object, neither self nor other, troubling identity, and order with the instability of boundaries, borders, and limits” (Zakin). In Powers of Horror: An Essay on Abjection, Kristeva describes the process by which identity is constituted. Identity formation is a process involving the establishment of boundaries between that which is the self and that which is not the self. It starts with the individual beginning to a distinction between the self and the body of her mother. For this to happen, the person pushes away from the other. Anything that is between the self and the other, that is both me and not me, falls into the category of the abject. These things include an open wound, excrement, nail clippings, pus, blood, sweat, even the skin on the top of milk. The abject often evokes the physical reaction of nausea because it reminds us of the fragility of the boundaries that constitute the self. Thus, the abject is “horrifying, repellent, but also fascinating; it is strange but familiar” (Zakin). Zombies generate revulsion in the viewing audience because they evoke the fear of the abject; they challenge identity in the same way the abject does. Two things are necessary for zombies to elicit revulsion as falling under the category of the abject. First, in order to inhabit the liminal space between that which is the self and also not the self, they need to have a strong association with the self. This is an easy task for the zombie, because it looks just like us; it is the most human of monsters. Secondly, they must be not the self. This is accomplished by them being dead, and by their resultant state of decay and the bodily fluids they ooze and spew. Thus, the zombie “disturbs identity, system, [and] order. [It] does not respect borders, positions, rules” (Kristeva 4). The zombie is, therefore, abject. As monsters, zombies help us understand who we are, by challenging the boundary between us and what we aren’t. The abject does this as well. In the zombie we have a convergence of monster and abject. That’s why zombie movies are disgusting. I would like to underscore once again, that the abject, like the zombie, challenges physical (or immanent) categories for, to the modern secular self, there is nothing else. The Modern secular self assumes it is simply physical. The zombie forces us to face the implications of this belief. It is purely physical, purely biological–and totally disgusting. This is unsettling. This is what monsters do. Lennon, Kathleen. “Feminist Perspectives on the Body.” The Stanford Encyclopedia of Philosophy. 28 June 2010. Web. 19 Sept. 2012. Zakin, Emily. “Psychoanalytic Feminism.” Summer 2011. The Stanford Encyclopedia of Philosophy. Web. 9 April 2012.